Margaret May’s workshop series empowers women to resolve existing psychological or emotional barriers that inhibit meaningful individual and family philanthropic giving. The following topics are available as 45-minute keynote speeches. They can also be designed for half or full day interactive, multidimensional workshops. 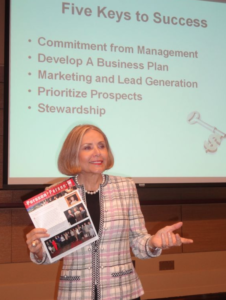 Download Margaret May’s past speaking engagements now. Call (561) 202-0863 or e-mail mm@margaret-may.com to customize a program for your audience. A keynote speech or interactive workshop designed to inspire and empower women to discover and embrace how their deeply cherished personal values connect to their meaningful philanthropic work in the community. Women receive a new confidence and vision of far-reaching and infinite ripples they make as they live a purposeful life and leave a meaningful legacy of time, talent and treasures. The session takeaway is a pebble in an organza bag, sealed with an inspirational quote. An insightful keynote speech or workshop that explores and comments on the emerging and dramatic impact women have on 21st century philanthropy. The session includes a historical perspective of women’s philanthropic milestones in the 19th and 20th century. The message serves as a foundation to inspire women how to partner with others in their quest for a more compassionate, diverse and strong society. A keynote speech or workshop with a hint of humor. It gives women insight into their specific emotional and psychological money attitudes. This session provides inspiration and direction to women so they can create their own vision for inner peace, growth, harmony and success with money. An inspirational keynote speech or workshop designed to empower women to gain insight into their unique values and philanthropic beliefs. Women discover how the “three rules of abundance” bring joy and harmony into their daily lives. Focus is on the process of bringing energy, purpose and passion to their wealth legacy. A timely keynote speech or workshop that gets right to the heart and soul of boom- generation women’s true destiny as Torchbearers for Virtuous Philanthropy. This dynamic presentation is suitable for fund-raisers and women donors. It provides an inviting forum that encourages women to discover their authentic philanthropic footprint in their community and to clarify their enduring legacy.